Middle East Fiber Cable Manufacturing Co. (MEFC), together with its Japanese partner Fujikura Ltd., held a seminar and technical workshops primarily within the Saudi Telecom Group as one of the actual efforts emanating from its strategic partnership through the Saudi Telecom Company to promote the local content “RAWAFED”. The meeting was opened with a speech by the CEO of Middle East Fiber Cable Manufacturing Co. Eng. Mohammed T. Alharthy in which he discussed the cooperation between the Middle East Fiber Cable Manufacturing Company and the Saudi Telecom Company in supplying and managing the fiber optic cable stock supplied to Saudi Telecom during the past years. He also talked about keeping pace with the development in the fiber optic industry and raising the production capacity to meet communication needs in Saudi Arabia in order to achieve the goals of the national transformation program 2020. 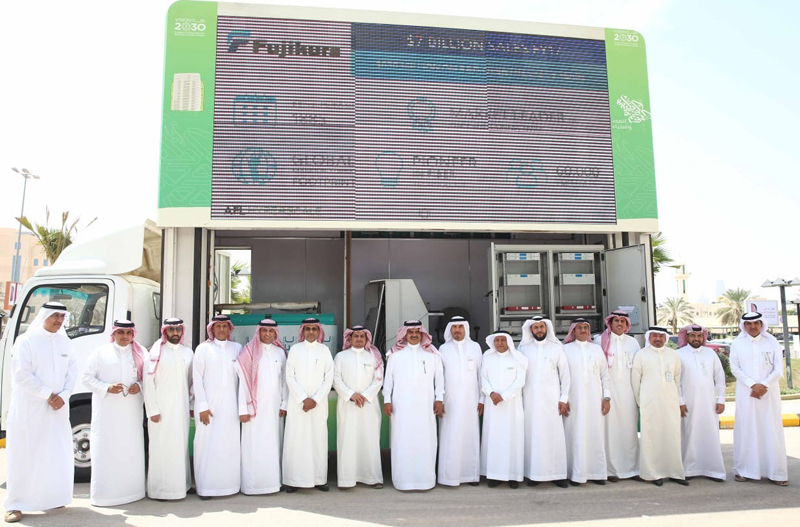 The Director General of Sales and Marketing and Representative of Fujikura Ltd., Yukiharu Maruyama, presented the partnership between MEFC and Japan's Fujikura Ltd., representing a joint collaboration between the Kingdom of Saudi Arabia and Japan in terms of trade and technical exchange to achieve the Saudi Japanese Vision 2030. The Middle East Fiber Cable Manufacturing Company (MEFC) signed a memorandum of understanding with the Saudi Telecom Group to promote local content, following the signing of MoU between Middle East Fiber Cable Manufacturing Company (MEFC) and its current partner; Fujikura Ltd. They have decided to localize the technology and the manufacturing of optical distribution network components and accessories as a direct feature of the RAWAFED program. Associated with that meeting was a mobilized exhibition within the complex of Saudi Telecom Company which aimed at demonstrating some products, which will be localized within the Kingdom of Saudi Arabia. A live demonstration by one of the Japanese expert from Fujikura Ltd., was held before the present audience and training initiatives were offered to guarantee the smooth transition towards such technology. The aim of these workshops is to explore opportunities for cooperation between MEFC and STC through the new company that will be established independently and to create an innovative environment between the existing MEFC and STC through the localization of unique Japanese technology of fiber optic cables. In addition, this cooperation will create an added value that will increase the efficiency of the deployment of fiber optic networks in the Kingdom and in the Middle East and North African market. Creating an innovative environment that is one of the pillars of STC's local content program “RAWAFED”, which has been interacted with MEFC and Fujikura Ltd. The initiative to localize the world-renowned SWR-WTC technology was intended to deliver value addition and to enhance local content in KSA and the region. This technology delivers efficient performance and efficient expenditure for the deployment of fiber optic networks. Moreover, MEFC and its current partner, Fujikura Ltd., have introduced AFLHyperscale (American Fujikura Ltd. Hyperscale) to Saudi Telecom (STC) as a global company specialized in the manufacture of optical distribution network components and accessories. Christopher Bowers, managing director of AFLHyperscale, Europe and Middle East market, introduced the services and products offered in this business segment in which it is intended for localization by 2020. STC audience expressed their desire to receive proposals that will add value to the company's network in the region, which was welcomed by Middle East Fiber Cable Company (MEFC) and AFLHyperscale. MEFC and AFLHyperscale intend to propose a training program that will ensure delivering the required skills and knowhow.